We’d love your help. 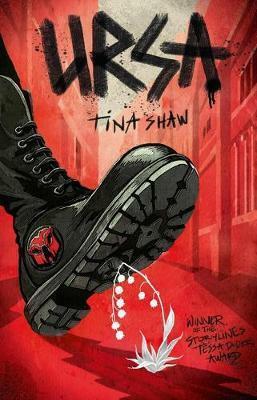 Let us know what’s wrong with this preview of Ursa by Tina Shaw. Fift This alternate history coming-of-age YA is the Winner of the 2018 Storylines Tessa Duder Award. Fifteen-year-old Leho can't remember a time when Cerels lived without fear in Ursa. His parents once tried to organise an uprising - his mother was blinded, and his father was taken away. But now his world is changing. Revolution is coming. People will die. To ask other readers questions about Ursa, please sign up. 3.5 stars - Compelling reading. Ursa is a city divided between the haves (The Travesters) and the have nots (The Cerels). 15 year Leho lives in Ursa with his Cerel family, constantly struggling for enough to eat and in fear of the Travester guards, the Black Marks. It hasn’t always been like this. His Nanna tells them of a time when everyone was equal, and the colour of your hair and who your family was didn’t matter. Now, with their father gone, Leho’s older brother Jorzy is the man of the family. 3.5 stars - Compelling reading. Now, with their father gone, Leho’s older brother Jorzy is the man of the family. Jorzy is a great story teller and musician, lifting their spirits in the evenings after another meagre meal, but he also has his serious side. Leho knows Jorzy is planning something, and he is frustrated and angry at not being included. Years before, their parents fought the regime of ‘The Director’ as he rose to power. Their rebellion left Mum blind and Dad imprisoned in a Wild Camp, like so many Cerel men. When an opportunity arrives for Leho to fight back at their oppressors, he begins making his own plans. The Director makes an announcement that excites many Cerels. Leho’s family are among many others who don’t trust him. Ursa soon becomes a bubbling pot that suddenly boils over, pouring revolution into the streets and washing Leho and his family along with it. Ursa may remind me of a real time in history, but Leho’s trials and troubles were all his own. He has to face many things – his rebellious brother, his own restlessness pushing him out onto the dark, quiet streets at night, a girl that both infuriated and infatuated him, and the threat of an even worse fate for his people.